Whilst it is often possible to identify aphids from photographs, you first need to know what to photograph. So let us begin with a few essential basics. Can a live aphid be identified - from a photo? If you take photos of the right characteristics at sufficient magnification, and you have an adult, and you know its host plant, then yes, you probably can identify it. But that's a lot of 'ifs' and you're probably going to need a good camera and a very good macro lens to succeed. If you keep a specimen in alcohol, and have a microscope with a camera attachment, then you're in with an even better chance (we shall consider those options another day). Most gardeners and naturalists come across aphids by chance, and assume identifying an aphid is as simple as identifying a bird. 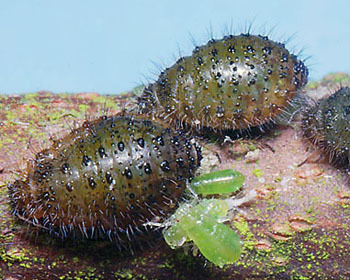 They take a photo (often of an isolated aphid on a nice background, such as a rock). Then look it up on the web or, failing that, send the photo to an expert - which tends to produce a rather disappointing reply. For example see the email exchange below, which provoked us into writing this. The honest truth is, aside from a few very distinctive aphid species, it is often impossible for an expert to identify an aphid species from such photographs - even tentatively. This is especially true of young aphids, and aphids off their host plants. There are nevertheless a few, very distinctive species. The giant willow aphid Tuberolachnus salignus pictured below is a case in point. 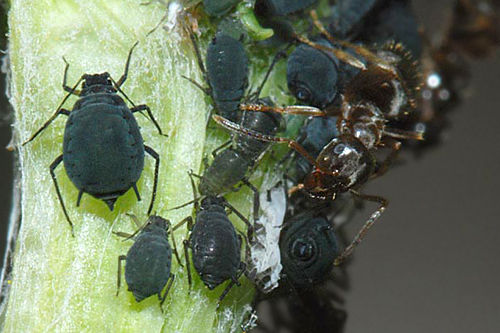 As well as having two black conical-shaped siphunculi towards the posterior end of the abdomen, they have a protuberance in the middle of the back, between the siphuncular cones (the aphid below has her wings folded over it). 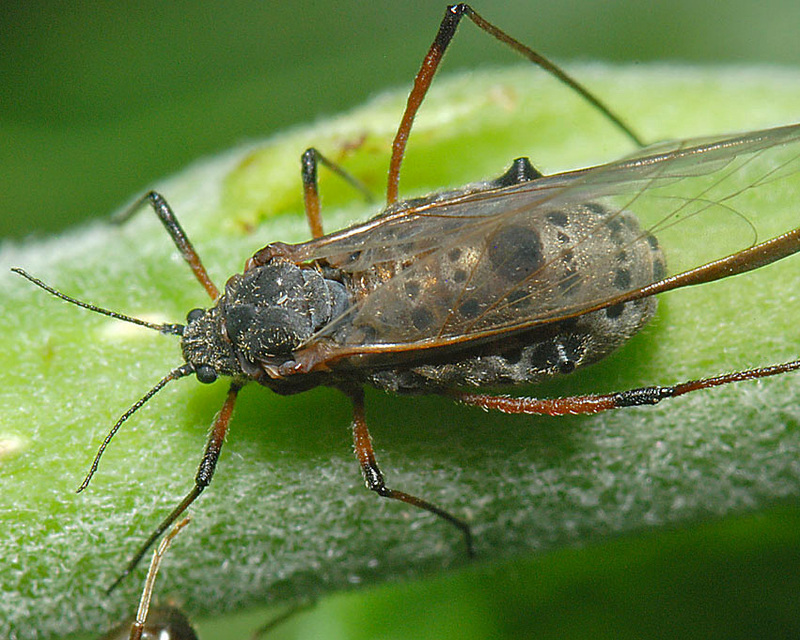 Another easily-identified aphid is the greater black spruce aphid Cinara piceae pictured below. This aphid has an entirely jet-black head, thorax and abdomen. Guest image, Copyright Ian Dawson, all rights reserved. 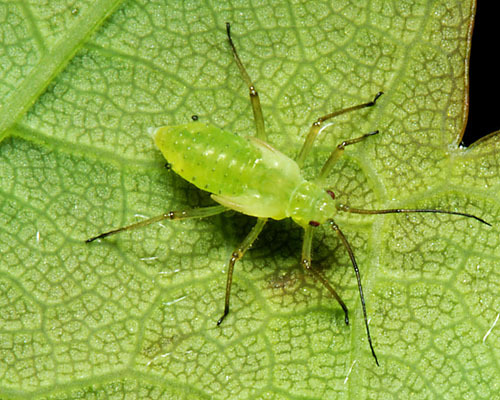 Most aphid species are either plant-genus specific, or plant-species specific. To identify those aphids it is usually essential to identify their host plant, at least to genus, and preferably to species (a good reference book, or web page, with pictures is invaluable). You can find the names of all the aphids that are recorded as feeding on a particular plant worldwide by going to Blackman & Eastop's host lists and keys. This may be a little tedious since, if you are in UK and the plant is indigenous to UK, your aphid is probably a UK species. A number of plant species have aphid species that occur on them and nothing else. So once you know the plant, to rule out accidentals, you merely have to confirm your identification. Sometimes there are just one or two distinctive species that are likely to occur on the plant, so you can be reasonably certain that any aphid you find belongs to one of those species. The first of these, the woolly beech aphid Pyllaphis fagi, is quite common. The wingless viviparae of Pyllaphis fagi are elongate oval, pale yellowish green, covered with wax wool. 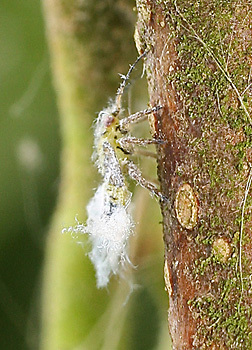 The woolly beech aphid is found feeding on the undersides of young leaves of beech (Fagus species). This causes the leaves to curl downwards on both sides of the mid-rib, and often to wither and die prematurely. 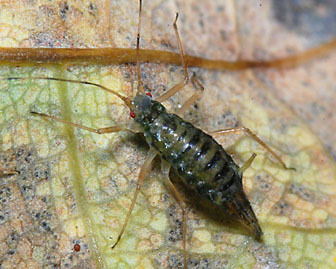 The second species is the variegated beech aphid Lachnus pallipes. These are large and shining dark-reddish to blackish brown. 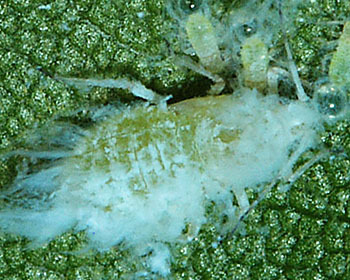 Variegated beech aphids are found on two-year-old or older branches and stems of beech. Lachnus pallipes is widely distributed in Britain, but seems to be quite rare. Why so few aphids feed on beech is a bit of a mystery when so many aphid species feed on oak (Quercus), the other main genus in the family Fagaceae. The leaves of beech have no recognised toxins and, when young, are edible to most animals. 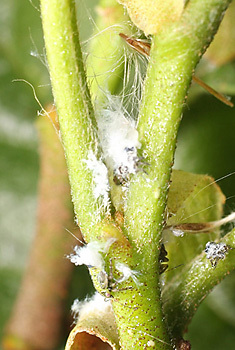 Other plants, such as holly, have their own specific aphid(s), but other polyphagous aphids may also be found feeding with them. 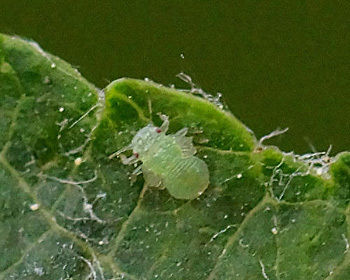 For example the holly aphid Aphis ilicis, pictured below, only feeds on holly (Ilex aquifolium), and characteristically curls the leaves as shown below. If your holly has those curved leaves you can be fairly certain Aphis ilicis were there, even if you cannot find them. There are a number of very common polyphagous species that can also occur on holly, such as the black bean aphid Aphis fabae (which is similar to Aphis ilicis) and the potato aphid Macrosiphum euphorbiae. 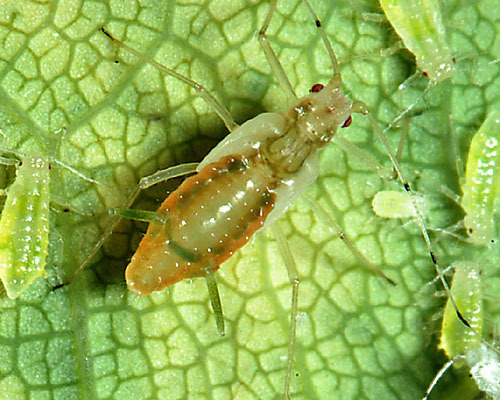 It pays to learn to recognise the most common polyphagous species of aphids in your area early on, to save getting excited about an aphid on a rare plant, which just turns out to be a potato aphid. Whilst there are relatively few common aphid species, and polyphagous aphids are among the most common, most aphid species are rare. 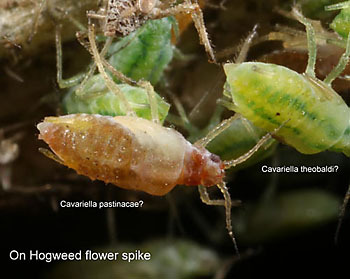 The most important caveat when using host plant identity to assist in aphid identification is whether the aphid's presence is accidental or not. 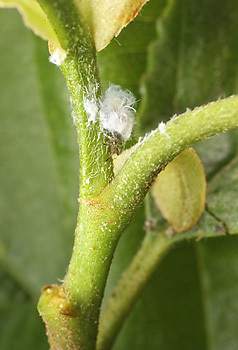 Observing aphids upon a plant does not necessarily signify that species is their normal host-plant. 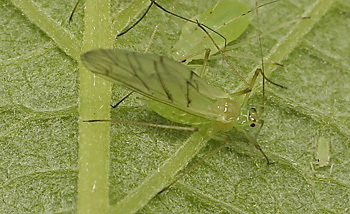 For instance the aphid shown above was feeding, apparently quite happily, on sycamore - but it is not a sycamore aphid. 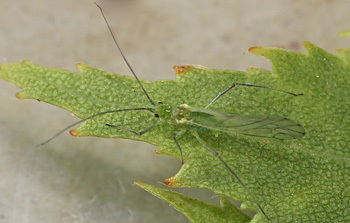 It is a birch aphid: a Euceraphis species and, although it is a fourth-instar nymph, it is unlikely to ever reach maturity on sycamore. It probably dropped off birch, either because of intraspecific competition, or disturbance by natural enemies, or simply the wind. It then climbed back up the wrong plant species. 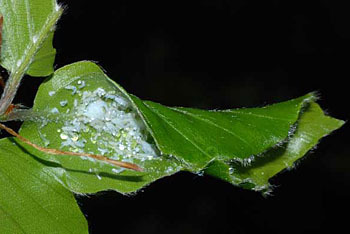 Such behaviour is especially common for active leaf feeders such as Drepanosiphum and Euceraphis aphids. 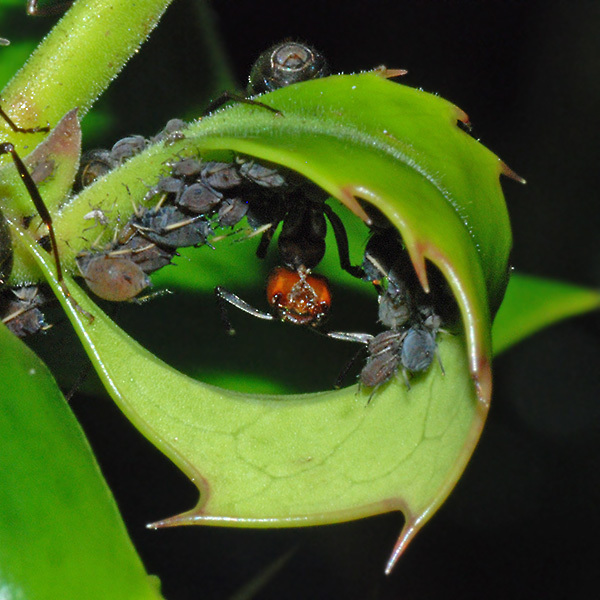 At one extreme some aphids accidentally find themselves on host plants upon which they cannot feed - so they move on or die. 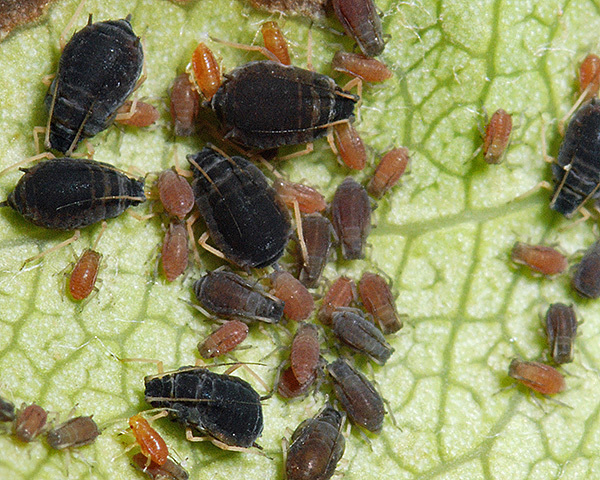 Then again a few hosts, termed reserve host or overflow hosts, whilst less-preferred may enable aphids to mature or to produce a few nymphs, albeit they may not develop into a healthy colony. 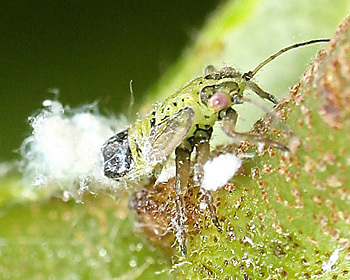 The other common reason why an aphid may be on the wrong host is that parasitized aphids commonly move to peripheral locations during the process of mummification by parasitoids. 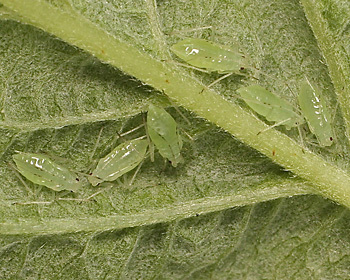 It is generally safe to assume aphids are on their 'true' host if several are present, and in the case of alates, if nymphs of varying ages are also present. 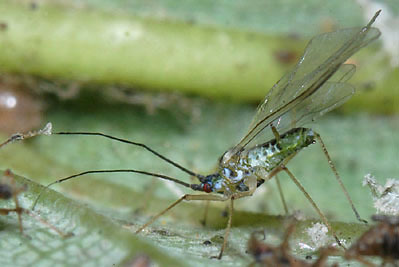 That said, some aphid species (such as the bracken aphid ) tend to disperse themselves such you are unlikely to find more than a single aphid - without nymphs. Do you have an adult vivipara? 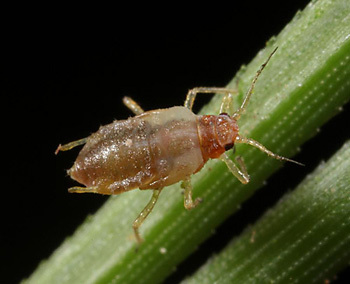 Although knowing what plant the aphid feeds on is a useful and sometimes essential bit of information, it is not usually sufficient to give an identification. 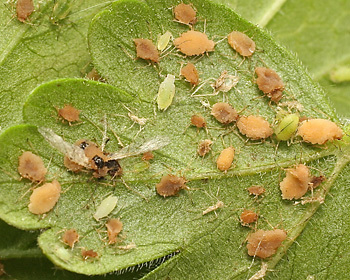 Some plant species, like oak and black poplar, have dozens of aphid species just in the UK and hundreds worldwide. 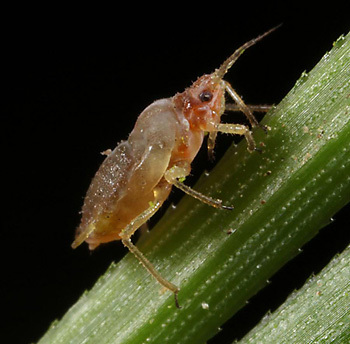 In order to identify the genus and species of aphid using the available keys and pictures you will have to assume you are looking at an adult female that gives birth to live young (this is known as a vivipara). Some keys also assume that you are looking at a wingless female (known as an aptera). 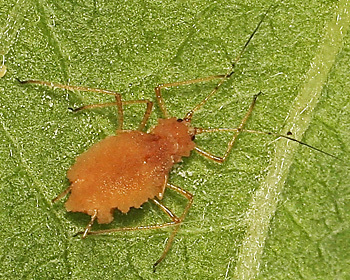 As an aphid grows up, it sheds its skin (moults) and moves-up one instar. 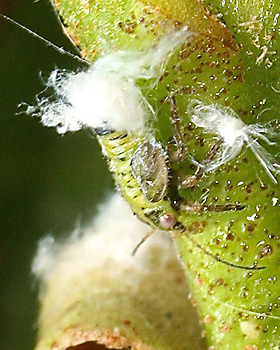 Newborn aphids are first-instar nymphs. These progress to second, third and fourth instar nymphs. 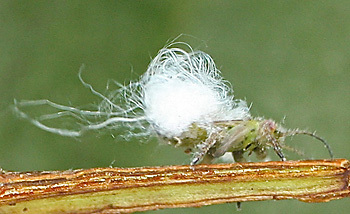 By their third instar, those which are destined to become winged aphids (alates) have wingbuds and are known as alatiform nymphs. The forewing buds usually overlap the hindwing buds in the fourth-instar alatiform nymph, but not in the third. 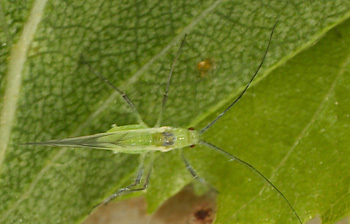 The first picture below shows a fourth instar alatiform nymph of the sapling sycamore aphid Drepanosiphum acerinum. 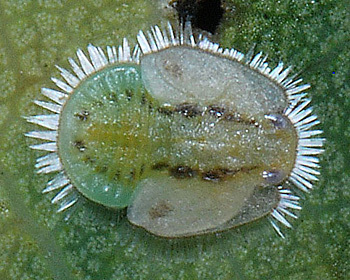 After their fourth instar, aphids undergo a final moult to become adults - either apterae (lacking wings) or alatae (alates or winged). The second picture above shows a mixed-age group of Melanaphis pyraria. Not surprisingly the adults are the largest (and in this case darkest) individuals. So if you have a large colony you could just look through and select the largest. That of-course assumes that there are adults there to find, which there may not be if an adult vivipara has given birth to a group of nymphs and then died. Fortunately there are other ways to distinguish an adult, but this varies between genera. With species in some common genera (such as Aphis and Macrosiphum) the cauda (the small terminal abdominal segment) of the adult is relatively longer than in any nymphal stage. 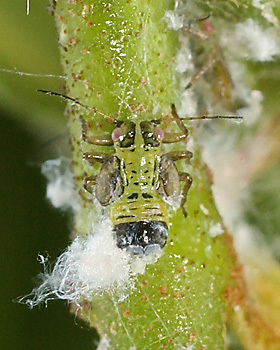 For example in the picture above of a colony of ragwort aphid Aphis jacobaeae - the adult is the larger aphid on the left. If no adults are present, then it may be possible to rear the immatures through to adult on cut foodplant in water. The great majority of aphids that you find will be female viviparae of varying ages. 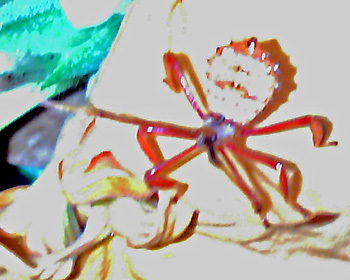 Adult viviparae do not lay eggs but give birth to live nymphs. Males are usually only present late in the year. 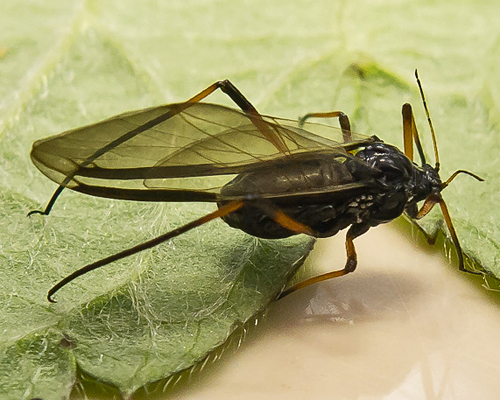 They are usually winged and have claspers at the end of the abdomen, as can be seen in the first picture below of a male common sycamore aphid Drepanosiphum platanoidis. 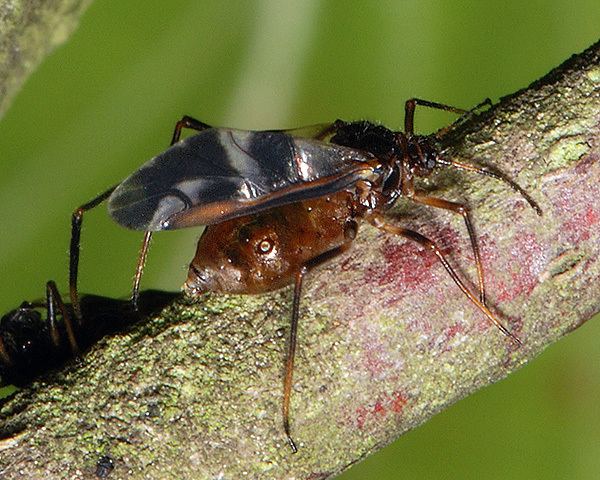 These males mate with egg-laying females called oviparae (see second picture above, again of the common sycamore aphid ). In some species oviparae have a characteristically narrowed abdomen and lay the overwintering eggs. The other main female form is the female 'fundatrix'. The fundatrix is the form that hatches from the eggs and, as its name suggests, founds new colonies in spring. The large hairy beasts below are fundatrices of the sycamore periphyllus aphid (Periphyllus acericola) with some of their small green offspring. The fundatrices of some species look very different from the normal viviparous female. You can find descriptions of fundatrices of different species in the specialist literature, but you will quickly run into problems if you try keying them out using a key intended for adult apterous viviparae. Comments (whether positive or negative) are displayed here, in the order received. [Re: Aphid identification via Influential Points web pages] I have just been informed about the Influential Points web site, with the extensive pages on aphids. I have many macro photos of aphids, but due to the difficulty of getting an ID, I've generally only taken them out of curiosity, rather than an expectation of getting a name down to species level. Can you advise me as to the practicality of using these pages to identify from photos alone - I have no specimens. Or is it more for guidance when identifying from a specimen? It is certainly our intention, as photos get better, to be able to identify an aphid down to species level from a photo. After all we no longer have to shoot birds in order to identify them, albeit it used to be considered essential! But there are two important provisos: The first is that you need to know the plant (preferably species) that the aphid is on in order to narrow down the choices. The second is that you must have of photo of an adult aphid - not an immature (fairly easy in some species, infernally difficult in others). If these two provisos are met, then you do stand quite a good chance of identifying the aphid from our site - assuming of course the photo is sufficiently good (you don't have to spend a mint on gear for this, although some do). All sorts of things can also help - especially pictures shot from different angles and targeted at key characteristics. Being able to recognise common - and distinctive - species helps. Note: some species are much easier to recognise live than pickled but, if you want to get serious, a second-hand microscope allows you to do lot with ordinary 'wet' specimens in propanol / 'rubbing alcohol'. We know a number of people are now using our site for identifying live (and preserved) specimens, and we are very ready to assist - although please try to identify them from the site first, and then check with us for 'confirmation'. We're also keen to put good photos from other people on our site - but only if they give approval first. Lastly, we always appreciate acknowledgment of assistance in identification if you use the photo on your own website. That sounds like quite comprehensive advice - thanks very much. Reviewing my old aphid photos, I see that I will have to up my standards. I have a tendency to forget to log the plant species when taking photos of certain groups of insects, such as heteropteran and homopteran bugs. It's a useful guide when identifying this family too, but subsequently trying to ID a plant when I only have a set of cropped images is a job that even a plant expert would probably fail at. Another problem is that a large number of my aphids were shot when walking across walls and other non-plant surfaces! I don't know why this is - I don't have a bias, as far as I know. I think, in summary, I might manage to ID a few of my species, but at the moment I'm giving my priority to trying to finalise my 2013 records for formal submission. Aphids will have to be done in my marginal time! Blackman, R. L. & Eastop, V. (2000). Aphids on the World's Crops. 2nd Edn. Wiley, Chichester, 466 pp. Aphid on Scot's Pine, in the middle of a small pine wood near Marazion. Only one present! Probably an incidental from another tree, I cannot think of anything on pine like this. Wondering if I have both Cavariella pastinacae and Cavariella theobaldi here on Hogweed. Maybe, but you need adults to separate the species- and both of these are alatiform IV instars. Dr Wagner, 30 March 2014, Unidentified aphid? On my first excursion I found an animal, about 2-3mm on a leaf. At home I tried to identify it and came to the conclusion that it might be an aphid but I am not really sure. So I ask Your help. As You see, macro-season is starting early this year. It's not an aphid but a psyllid (related group of Homoptera). 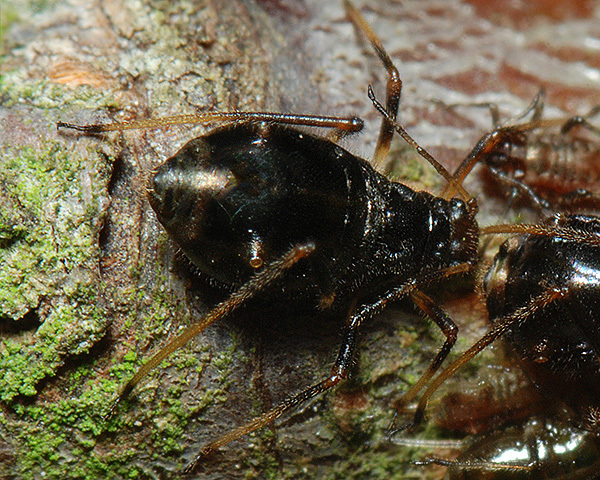 Superfamily Psylloidea; Familly Triozidae. 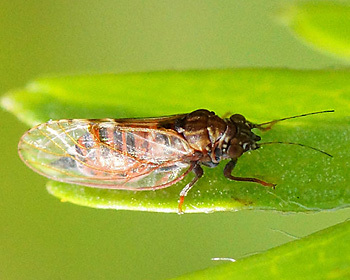 The most likely species is Trioza remota (oak psyllid). It has fairly amazing nymphs (picture attached) which you can look out for on oak leaves. Image copyright Dana Black-Boyd, all rights reserved. IF the insect you photographed is an aphid from your firecracker plant (Cuphea ignea), it is most probably one of the five species of Impatientinum that live on Cuphea species in South America (Mexico, Panama and Brazil). Only aphids have siphunculi. In most aphids they are very prominent - but a few aphid species have very small siphunculi (or just 2 pores, or none at all). Unfortunately the photograph you sent us did not show enough detail to see any siphunculi - or other key diagnostic features - so we cannot say if your insect was an aphid - but, if you have good eyesight or a hand-lens, you may be able to answer your question for yourself! Sorry we could not give you a simpler answer - hope this helps a bit. This looks like a first or second instar Coreid bug. As you may have gathered from the phrase "IF the insect you photographed is an aphid" we were very unconvinced that it was a homopteran - it did indeed look like like a heteropteran. The main reason for this mailing is a woolly creature that I found on Alnus glutinosa (Common Alder) beside the River Ivel. I have returned this morning and collected more. The woolly appearance of these initially looked to me very like on-line images of Prociphilus or Paraprociphilus tessellatus, though all the websites dealing with this appear to be American and I can find no reference to it on your site, in the old Kloet & Hincks checklist or other British websites etc. as actually occurring in Britain! Furthermore when I look closely at the insects themselves they look very different and rather unlike aphids, though they were in some cases attended by ants. It rather looks therefore as if something else on Alder may have solved a similar problem in a virtually identical way to the Woolly Alder Aphid! Other than the fact that they look more like nymphs of something I have no idea now what they might be! 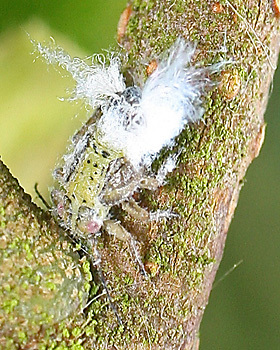 There is an image of something that DOES look identical to my species, again from North America at bugguide with the question "Woolly Alder Aphid??" Unfortunately it would appear that nobody has provided him with an answer! As it is not inconceivable that you will have encountered these when looking for aphids I wonder if you might perhaps have any suggestions regarding their identity. I have taken a large number of images and append some below. On the tree they looked very static but the insects are remarkably mobile once bits of Alder wih them on are collected. (I do incidentally find this also happens with a lot of aphids, with those in massed aggregations often quickly dispersing). I think I have cracked this one and that these are nymphs of the Alder Psyllid (Psylla alni). Adults of this species are often common at this site but interesting how closely the woolly waxy secretions resembel those of a North American woolly aphid! Yes they are indeed Psylla alni. The nymphs are rather fascinating and we've often found quite large colonies. 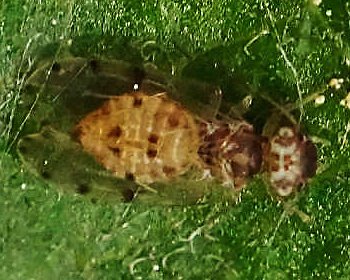 Today I have controlled our apple-trees and discovered two aphids, one adult and the other possibly a baby-aphid. The bigger one had about 2-3mm the small one 0,5-1mm. I appreciate your help. Image(s) copyright V. Wagner, all rights reserved. Neither are actually aphids, but both are still interesting! The first is an adult psocid (order Pscocoptera) sometimes called barkflies. I'm not up on identifying species in this group, but pictures and info are here and here. The second is an immature psyllid (Psylloidea), probably a Cacopsylla species. Pictures and info are here. I have two queries dating from the beginning of May, though I think both of these are the same thing. On Raspberry leaves in our Clifton garden, 01 May 2014. The final one looks as if it is again the victim of Entomophthora attack. On Gooseberry leaves from same site and on the same date what would appear to be the same species heavily infected with Entomophthora. I had intended following up on these but when I looked again a week later there were only dead remnants on both host species. Isuspect though that this is again the genearlist Macrosiphum euphorbiae but would be grateful for confirmation. Then today on Birch tree on our road verge I think the same thing again, alates with legs, antennae and body all very long. Assuming these are all correct then I think I have probably cracked this one now! The final two here are rather more interesting I think. Re raspberry aphid and birch aphid, I suspect you're suffering from a slight attack of Macrosiphumeuphorbeitis... - defined as concluding everything is that species simply because it does on occasion seem to turn up everywhere. The one on raspberry is possibly M euphorbiae, but also check Amphorophora idaei. The goosebery one I'm not sure about. The one on birch is not M. euphorbiae but a Euceraphis sp. - it has short siphunculi. Apologies also for bout of Macrosipumeuphorbeitis. I will be on my guard for this but was I think getting a bit overwhelmed by these and a host of other things that I should actually have been getting on with!! I will check out the one on Raspberry again.